An automotive design museum in Chesterfield Township combines classic cars, mechanical wonders, and one amazing grand organ. When silent movies proved popular a century ago, theater owners built elaborate entertainment palaces and equipped them with the finest organs of the day. With talking films, radio, and television still on the horizon, grand movie halls were a big hit among the burgeoning middle class. The most sought-after and elaborate organs of the day came from the Rudolph Wurlitzer Co., which got its start in Cincinnati in 1853 and relocated to New York in the 1890s. Of the hundreds of organs built for theaters, churches, museums, and private residences, only one is believed to have lacked an invoice. From the so-called Mighty Wurlitzer line, the “house model” was initially designed for Wurlitzer’s own mansion in Cincinnati. Built in 1923, the grand pipe organ eventually was redesigned and enlarged to be a complete concert-grade theater organ, utilizing select pipes from other 1920s-era Wurlitzers. The instrument eventually made its way to Boca Raton, Fla., where it was installed in the Milhous Museum. 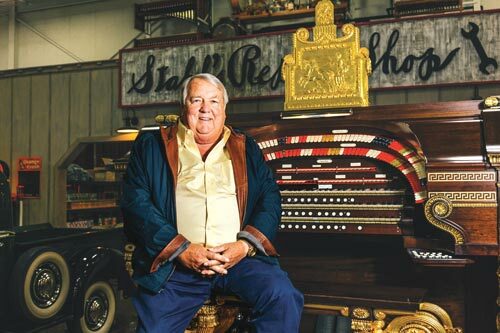 Two years ago, when the organ came up for sale, it was acquired by Ted Stahl, executive chairman of GroupStahl, an international association of companies in the textile and apparel sectors that’s based in St. Clair Shores. A collector of all things mechanical, in 2013 Stahl opened a classic car museum under the nonprofit, Stahls Automotive Foundation, in Chesterfield Township (it evolved from a smaller collection in St. Clair Shores). Although the museum is home to more than 80 cars; a reproduction of a Big Boy drive-thru restaurant; vintage signs; jukeboxes; and other marvels, the star of the expanded facility is the Mighty Wurlitzer and its stacked keyboards that control 23 sets of pipes (1,524 pipes in total). The dozens of organ keys power piano notes, trumpets, saxophones with brass resonators, violins, violas, flutes, clarinets, tubas, and oboes — 208 tuned percussion notes in total. Other musical offerings include a marimba, xylophone, glockenspiel, chimes, celesta, vibraphone, piano, and tuned sleigh bells. “Trap” percussions include a snare drum, cymbals, castanets, and tambourines, as well as silent movie sound effects including, of course, a car horn. Over time, Stahl collected more cars and had them housed in three different buildings in St. Clair Shores. Of the cars he’s collected, including offerings from Packard, Auburn, Bentley, Cord, Hupmobile, Willys, Graham, and Oakland, the common thread linking each vehicle is the creative spirit that brought the vehicles to the marketplace. 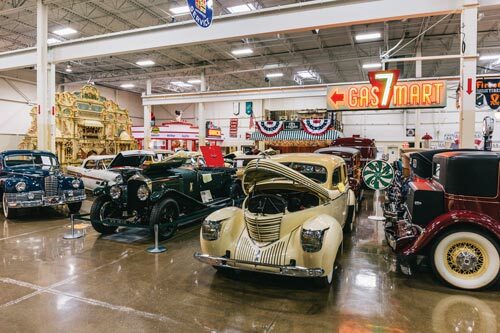 Open to the public on select days — Stahl’s is a popular attraction for car clubs, seniors, and schoolchildren — the 35,000-square-foot museum lacks ropes or barricades. Stahl prefers that visitors have the opportunity to get close to the vehicles and look inside.